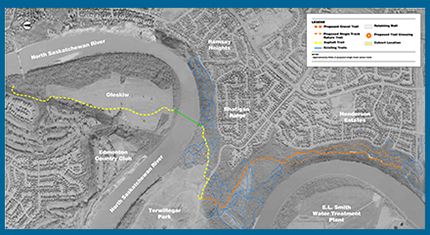 The West End Trails project added approximately 5 km of primary (paved) and secondary (gravel) trails to the river valley main trail. The north extensions link Terwillegar Park with the Fort Edmonton Footbridge. 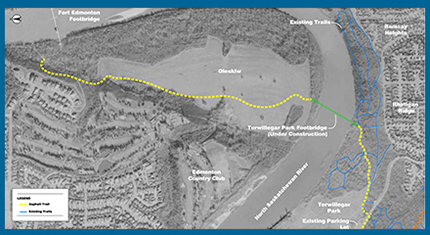 The south extensions connect Terwillegar Park to the Anthony Henday pedestrian river crossing. Find out more about the West End Trails. 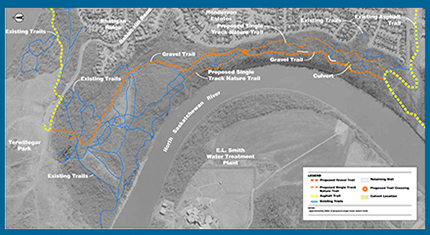 Construction on the West End Trails began in July 2015. Construction was completed October 2016. Learn more about the community engagement process and environmental reviews.